I have been wearing glasses from when I was in Year 7, twenty five years ago to be exact. As an optometrist told me recently “You are lucky to be short sighted, because your eye sight will actually get better as you get older”. You see as people get older, they usually need glasses for reading and become far sighted but because I am short sighted, I won’t have this problem. I know some people have a complex about wearing glasses but I have never had an issue with it. I have tried contacts but when you have stick something in your eye and then it gets lost behind your eye lid or in your eye socket somewhere and you think it will never come out, it can be quite a deterrent. I just never liked contacts. I’ve always liked the look of glasses, I’m not sure if it is the extra intelligence I feel I have, the respect I get when I’m wearing them (like, I must know what i am talking about!) or confidence they give me but I honestly like wearing them. Maybe because it is another fashion accessory I get to wear and play with, which is more likely the case. I also love guys with glasses (above)…and who wear suits… and a nice men’s fragrance.. erm.. ok moving along…. And guess what? Glasses also help me see better, which I guess is the most important part, isn’t it? Last year I had my 2 yearly optometrist appointment at OPSM and nothing had changed. 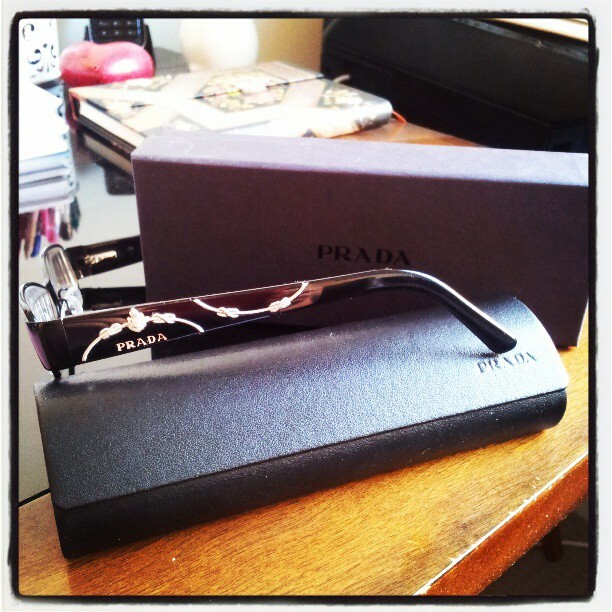 The only thing to change was the new Prada glasses I bought and which I am totally in love with. I have been going to OPSM for nearly all of the 20+ years I have needed glasses. Why? Because their customer service is outstanding and you cannot compete with the quality of their glasses/ frames. I have been to one of the other well known optometrists and they claim to save you but in the long term, really they don’t. I had prescription glasses and sunglasses from the ‘saver’ store and they didn’t even last six months. The sunglasses I had to continually take back to get fixed. The quality just isn’t there. I guess that is why they are so cheap. In the long run you have to pay more because you have to replace the frames all the time, whereas with OPSM you don’t. I have Calvin Klein Sunglasses I bought 10 years ago from OPSM and still wear them during winter, as they have a brown tint as opposed to the black tint I wear in summer. The give just enough protection but light enough that I can see on grey, dull, overcast days. I have never had to get the frames fixed once! When OPSM contacted me and asked if I would like to review their new Accufit System, I happily agreed. Do you know how hard it is to decide on a pair of frames? It is even harder when you are squinting to see what you look like in the frames when you can’t see without your glasses on. It is like taking pot luck and hoping for the best. Not anymore! That’s all changed with the Virtual Mirror. It takes photos of you wearing different styles. You can compare up to four designs side by side onscreen (below). 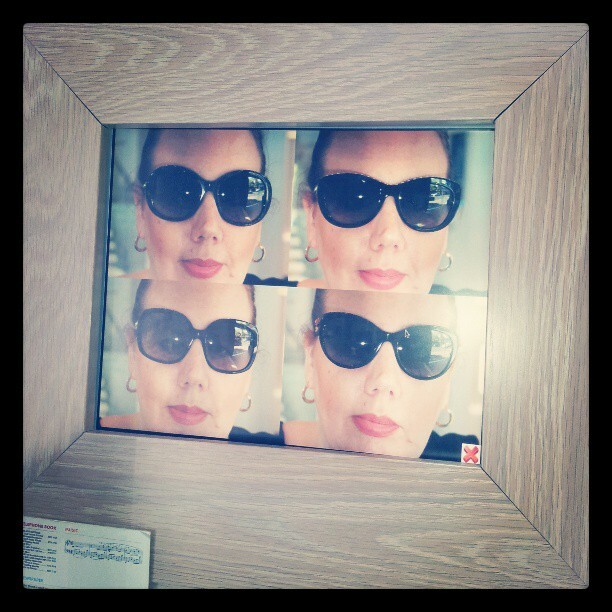 You can even see how frames look in profile and from other angles, so you can pick the ones that suit you best. I needed new sunglasses and I must say, it is so much easier to pick a pair now. The sit is even better now as well. Fitting the prescription into the lenses involved a ruler, a felt pen and a steady hand. Thanks to the ACCUFIT Fit Sensor, that’s now obsolete. It attaches to your frames to get precise measurements of your face and eyes. These measurements are analysed to determine the optimum placement of your prescription. The resulting fit is clearer and way more precise than anything you’ve ever seen before. Ill fitting glasses can give you headaches and sore ears, I’ve had that before and it isn’t fun. This new technology is brilliant. I chose a pair of Chanel sunglasses (If I remember rightly, they are the bottom left pair and I am going a darker lense). Before I chose my sunglasses, I had my eyes tested and the technology used to test my eyes, compared to a year ago, is amazing. OPSM now have Ultra Wide Digital retinal scan. A machine scans your eyes, which is uploaded to a computer and the optometrist can actually see how healthy the inside of your eyes are and as we get older, this is very important and can pick up eye diseases and things like Macular Degeneration, Glaucoma, cataracts etc. The boys are due to have their eyes tested again soon and I won’t have any hesitation in going back to OPSM. *For this review I was gifted the Chanel sunglasses pictured. Next Post Is pain in the name of beauty worth it?